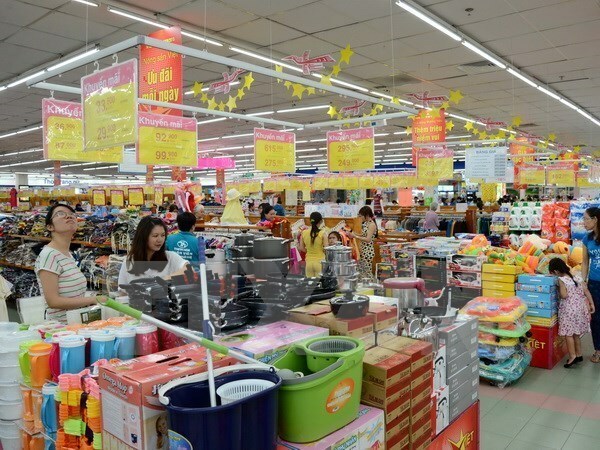 HCM City (VNA) - The consumer price index (CPI) in the southern largest economic hub of Ho Chi Minh City in August rose 0.5 percent from the previous month and 3.63 percent over the same period last year, reported the municipal Statistics Office on August 29. According to the office, the prices of six out of 11 surveyed goods groups saw month-on-month increases, with the highest surge of 2.53 percent seen in transport. The prices of food and catering services went up 0.6 percent, while the prices of culture, entertainment and tourism services increased by 0.3 percent. The prices of housing, electricity, water, fuel and construction materials rose 0.28 percent; education up 0.12 percent; other goods and services 0.04 percent from July. According to the municipal Statistics Office, the prices of home appliance dropped 0.12 percent, and drinks and cigarettes fell by 0.08 percent. The prices of medicine and healthcare services; telecommunication; garments, hats and footwear remained unchanged.